Ominaista :erikoinen hiottu Austraalialainen opaali, jossa voimakkaat sateenkaaren värejä pinnassa / boulder opal "
Opal is a poorly crystalline or amorphous hydrous silica that is compact and vitreous and most commonly translucent white to colourless. 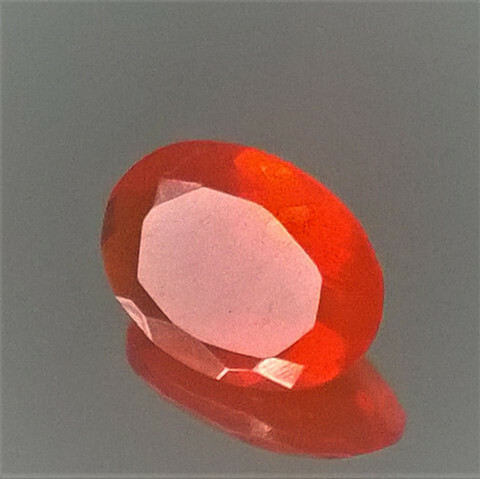 Precious opal reflects light with a play of brilliant colours across the visible spectrum, red being the most valued. Opal forms by precipitation from silica-bearing solutions near the Earth's surface. Electron microscopy has shown that many opals are composed of spheres of tens to a few thousand angstroms in size that are arranged in either hexagonal or cubic close packing. The spheres are composed of hydrous silica that may be either almost cristobalite-like, tridymite-like, mixtures of both, or random and nondiffracting. The specific gravity and refractive index are lower than those of pure silica minerals. The play of colours in precious opal arises from the diffraction of light from submicroscopic layers of regularly oriented silica spheres. When heated, opal may lose as much as 20 percent of its weight of water, fracture, and then crystallize to one of the silica minerals described above. Opal usually contains 4 to 9 percent water, but lower and much higher values have been observed. The contents of alumina, ferric oxide, and alkalis are variable but may amount to several percent in light-coloured opals and more if pigmenting minerals are also present. Precious opal has been synthesized. Opaline silica is a friable hydrous silica found near hot springs and geysers.